This award is presented to a hotel historian who best demonstrates a passion for preserving, displaying, and interpreting the history of his or her hotel, a true ambassador of the past. Born in Webster, New York, Jim Hewes has had an affinity for history and education since he can remember. “I’m somewhat of a student of history,” says Hewes. “I used to go to garage sales and stuff and I’d see a history book and I’d go right to the index. You accumulate information over time.” And accumulate is just what Jim has done, curating an extensive collection of books on U.S. history, The Willard and the many historical figures that have walked its halls. Jim first walked the storied halls of The Willard in 1963, while visiting Washington, D.C. with his family as a ten-year old boy. “My first day working at The Willard brought back memories of my first exposure to the hotel,” Hewes says. 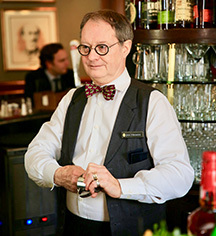 Twenty-three years later he would return to the iconic hotel to work as a bartender at the legendary Round Robin Bar, the oldest bar in the city operating at its original location. Google Jim Hewes, Round Robin Bar, and nearly 11k search results appear. 90% of those search results speak to the famed mixologist that he is and the strong command of U.S. history that he possesses. 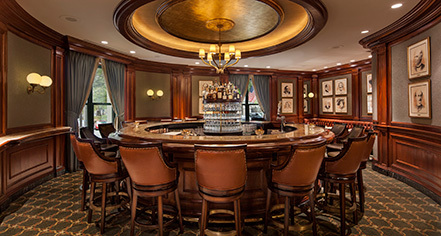 A winner of DC Craft Bartender’s Guild Lifetime Achievement Award, Jim has become as synonymous with the Round Robin Bar as the bar is with the Willard InterContinental. A frequent guest lecturer at special events throughout the city including at the National Press Club, Smithsonian Institute, and Distilled Spirits Council, as well as a contributor to history pieces on National Public Radio, the Food Network, the Travel Channel and CSPAN, Jim is highly sought after by hotel guests and the media for being the historian that he is. He also frequents as a background source for writers, editors and authors for both food and beverage stories as well as history related pieces. Being in the shadow of historic political giants has given Jim a profound respect for The Willard and the role it has played in U.S. history for 200 years. Throughout his time at the hotel, he has been able to combine his deep appreciation for the historic significance of the hotel with the ongoing context of our Nation’s history. “On a daily basis, the political, economic, and social fabrics of the Nation are coming together in some way at this hotel. Not to mention at this bar,” he says. Throughout the many facets of his job, Jim aims to weave as much history into them as possible. A few years back, Jim distilled the drink preferences of the U.S. presidents into what is now the bar’s most highly coveted Presidential Cocktail Menu. Some drinks are based on what the presidents were known to have, while others are more symbolic to the time period. For example, the Blue Hawaiian was created in honor of President Barack Obama. Made with Tequila, Curacao and lime juice, “you feel like you’re looking at the beautiful waters of the Pacific and, of course, this honors the president’s heritage in terms of growing up in Hawaii,” Hewes says. Since its debut, the menu has generated significant media attention for its unique historical elements from media outlets including Forbes, NPR, and the Washington Post just to name a few. In February 2017, Jim Hewes hosted a sold-out History Happy Hour at the Round Robin Bar. As noted by BisNow, a media outlet covering the event, “Jim Hewes, the man behind one of the most renowned hotel bars in America, took us through history by way of serving political secrets of the Hill: favorite cocktails of the 45 U.S. presidents.” The event, billed as part history class, part mixology class, allowed guests the opportunity to learn a bit of history while also being taught how to make some of the most popular drinks from the bar’s Presidential Cocktail Menu. The event was such a hit, that the hotel plans to make History Happy Hour a regular event. A “recreational historian”, as referred to by Hewes himself, is a historian in every sense of the word. An ambassador of the Willard InterContinental for over thirty years, he strives to keep the hotel’s storied history alive in everything that he does.